Here at our unplugged cottage in the woods, I’m forever trying to conjure up ways to engage my not-so-little boys. Especially on gray days like today. When it’s beautiful outside, there’s a million things to keep em’ busy and having a blast, but we’ve had our share of Octoberish weather this summer and it’s all too easy for them to resort to Clash of Clans on their phones. Which makes me slightly nutty. So at a visit to a local craft/hobby store, I spied this “wood burning” tool along side a batch of tree slices, turned into woodsy-cool plaques. So I bought it all. 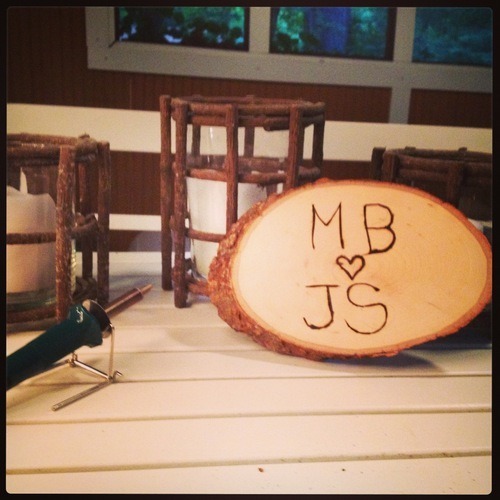 Because burning your name or any other fun something into wood with a hot tool has tween-teen boy heaven written all over it, no? Plus I wanted to play with it too. For under 20 bucks I got the tool (that’s basically like an old-fashioned ink pen that gets SUPER hot when plugged in), and several sizes of those tree-slice thingys. And we got to work. 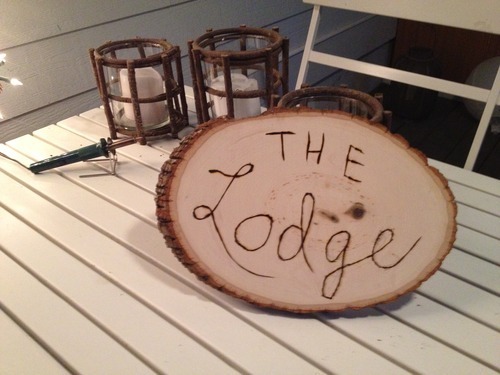 First, we all took turns burning letters into a sign for our screened-in porch, we call “The Lodge”. Now, it should be noted that this activity is for older kiddos, I’d say 10 and up. Girls would completely dig this activity too, I just happen to have dudes. 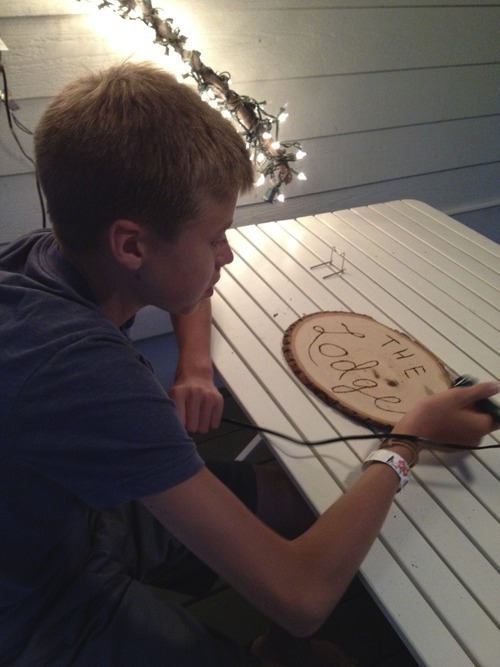 My son Truman was 11 the first time he used the hot carving tool, and I was right there supervising. Maxwell was 15 and all on his own. It takes a bit of practice to learn how the tools works, how to best write with it, and how long to hold the tool down on the wood for best results. But it’s great fun figuring it all out. So, next time you want to be a total rock-star mom to your older kids…especially those way-to-cool-to-craft, boys, give this little activity a try. Just don’t call it an “activity”. Go with “dangerous wood-carving experiment”.